Great gift for the home, apartment, office, dorm or den Prefers bright, indirect light or artificial light Keep evenly moist, not wet or dry The plant you will receive is growing in a 4" pot. Ocean is a new spider plant with more white in the leaves and white flowers on long stems that seem to dance in the air. Spider Plants make excellent house plants or indoor plants as they are not only such easy-growing plants but have beneficial properties in cleansing the air of pollutants, especially formaldehyde and carbon monoxide. As it tolerates artificial lighting very well and has air purifying abilities, it's most ideal in office environment where electronic pollutants are emitted. Requires bright light or filtered sunlight for best growth and vibrant leaf colors. 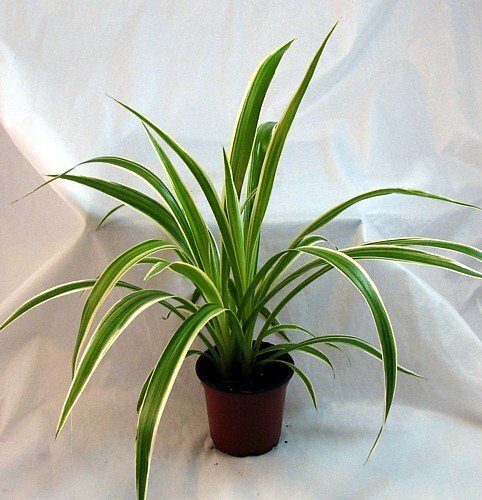 Never locate Spider Plants in full sun that will scorch their foliage. Remove yellow or dried leaves to keep it tidy. Fertilize sparingly as excess nutrients can retard its ability to produce more plantlets.